As of 1 January 2017, the Department of Business Communication was dissolved. The disciplines of business languages were transferred to the Faculty of Arts, while the corporate communication discipline merged into the Department of Management. 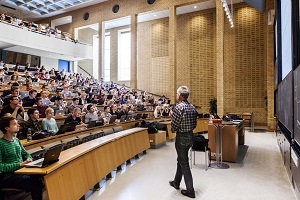 As of April 2015, Aarhus BSS is the new brand name for the business school at Aarhus University, which since the merger of Aarhus School of Business and the Faculty of Social Sciences in 2011 has been known as School of Business and Social Sciences. However, the long name made it difficult to brand the business school in a sharp and clear manner, and was therefore changed to Aarhus BSS by the management in 2015. Along with the new name comes a new logo and a new brand strategy. As part of the school's internal analysis process, three departments changed name: Department of Business Administration was changed to Department of Management, AU Herning was changed to Department of Business Development and Technology, and Department of Economics and Business was changed to Department of Economics and Business Economics. School of Business and Social Sciences, now Aarhus BSS, was created as part of the biggest change in Aarhus University’s history – The Academic Development Process, where the University Board decided, among other things, to merge Aarhus School of Business and the Faculty of Social Sciences. The step was considered necessary in order to create a broad business school capable of contributing not only to the traditional business education but to solving the grand business and societal challenges of the global world through incorporating new interdisciplinary approaches to research and educational activities and thus differentiating the school from the majority of the traditional business schools and remaining competitive in local and global markets. On 1 January 2011, Dean Svend Hylleberg became dean of the new business school. A position he held until June 2015. As part of the merger, the five departments at the Faculty of Social Sciences (School of Economics and Management, School of Law, Department of Political Science, Department of Psychology and the Institute of Business and Technology in Herning) and the six departments at Aarhus School of Business (Department of Economics, Department of Management, Department of Marketing and Statistics, Department of Language and Business Communication, Department of Business Studies and Department of Business Law) were merged into seven departments. Three centres, the Center for Alcohol and Drug Research, the National Centre for Register-based Research and the Danish Centre for Studies in Research and Research Policy were integrated within the Department of Psychology and Behavioural Sciences, the Department of Economics and Business and the Department of Political Science and Government, respectively. 2011 was a transitional year for School of Business and Social Sciences, where all departmental changes and adaptations were in the process of implementation at the school. 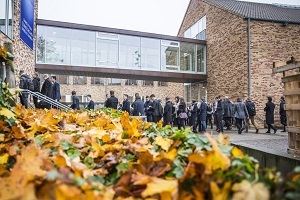 On 1 January 2012, the two constituent units (Aarhus School of Business and the Faculty of Social Sciences) fully merged into School of Business and Social Sciences. Get an overview of the six departments at Aarhus BSS. The Aarhus BSS faculty management team consists of the dean, the vice-deans and the six heads of department.